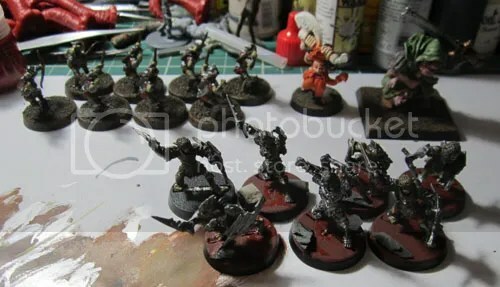 From the Painting Desk #11 – A Week’s End/Easter Weekend LotR Challenge | Azazel's Bitz Box. After the last one of these helped motivate me to finish a whole lot of (mostly tedious) stuff done in a reasonably fast (for me) timeframe, I’ve decided to go again. 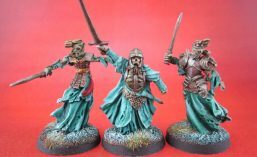 Again I’ve also posted these in a LotR forum’s monthly army painting challenge pledge thing, because they’re almost all LotR models. 8 Moria Goblin Archers that I got half-painted and am ending up giving a full repaint to (already did the bases), and 7 metals that will act as Captains or at the very least, KoW unit leaders. For pleasure, there’s a Dwarven Slayer and C23 Ogre that were both started 10+ years ago which I’ve started doing some work on again lately. Time to get those suckers finished! If I manage to get these done in time, I’ve got 2 units of cavalry I want to get rid of, since they’re taking up valuable space by being half-painted in one of my cabinets. But that’s my next self-challenge. This entry was posted in Fantasy Gaming, Lord of the Rings, Moria Goblins, Work in Progress and tagged Lord of the Rings SBG, Moria Goblin Archers. Bookmark the permalink. ← From the Painting Desk #10 – How Should I Base this Brass Bull? Might be time I try the same. I finished 3 archers over the last week – maybe time to try and do my 3 elves over Easter! Do so – and post them up!